There is nothing quite like rugged Scottish scenery to quieten a busy mind. 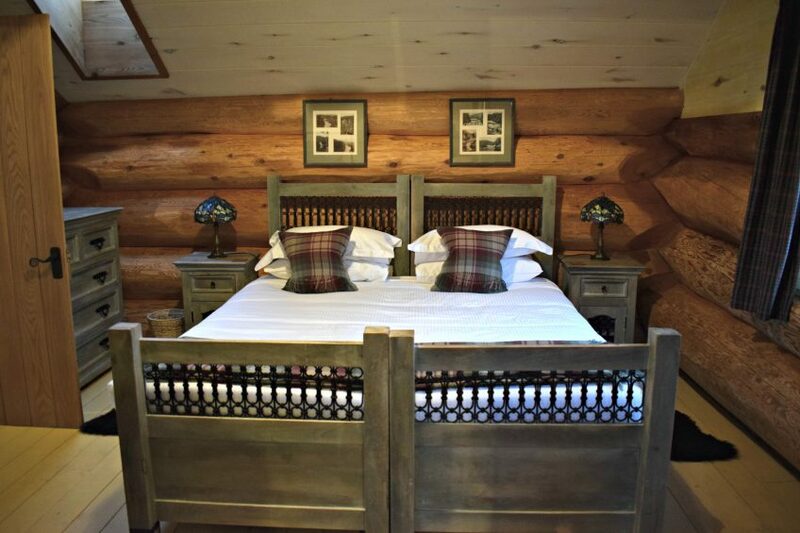 During a particularly busy week, when my mind was whirring with to-do lists, we headed to Eagle Brae – a luxury self-catering eco resort nestled between Glen Affric and Glen Strathfarrar. It is impossible to do anything other than switch off and completely unwind when staying at this tranquil oasis in the Highlands; the idyllic surroundings an antidote to stress and busyness (I felt my shoulders relax for the first time in days and the whirr of thoughts start to slow down). With handcrafted Red Cedar log cabins complete with grass roofs, sweeping views of the glen and red deer roaming the grounds, it was a ‘back to nature’ experience (which was somewhat at odds with all the Instagramming I did during my stay! I’d love to return for a digital detox). 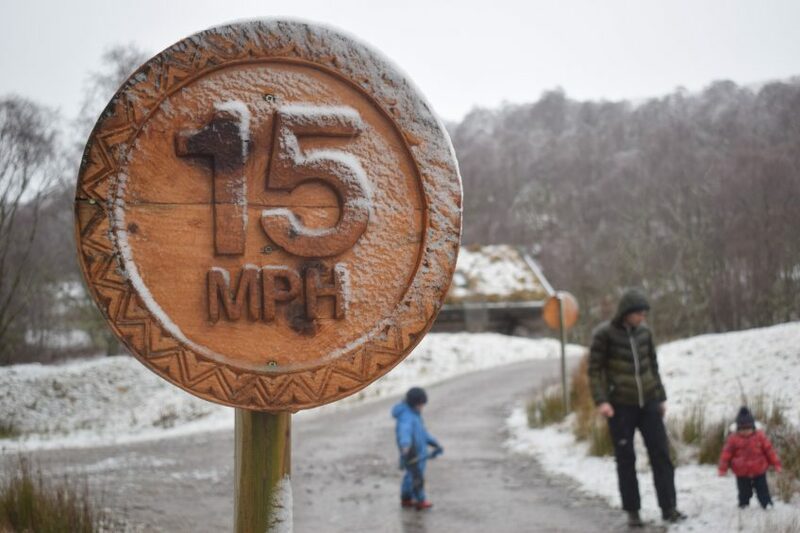 The first thing to greet you upon arrival are the handcrafted wooden signs – the Eagle Brae sign itself and 15mph speed limit signs (or perhaps the wandering red deer on the hillside, as it was for us). 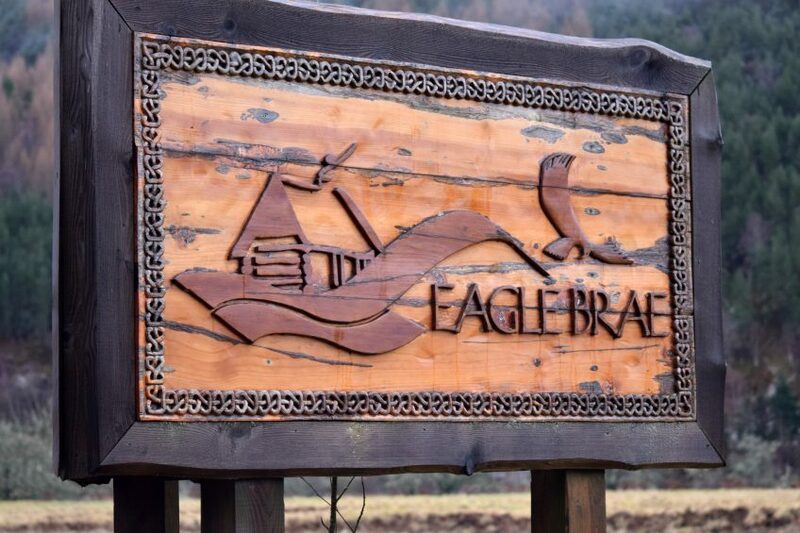 These beautifully carved signs are an indication of the attention to detail to come – the care and thought that has gone into everything at Eagle Brae is incredible. 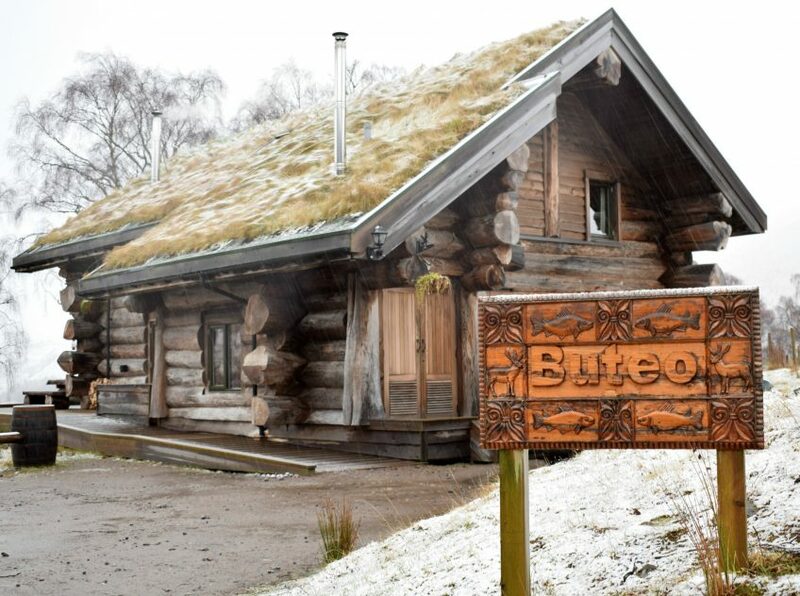 We stayed in Buteo (buzzard in Latin – all the cabins are named after birds), and because all the cabins are handcrafted (without any machine cut logs) every cabin is unique. 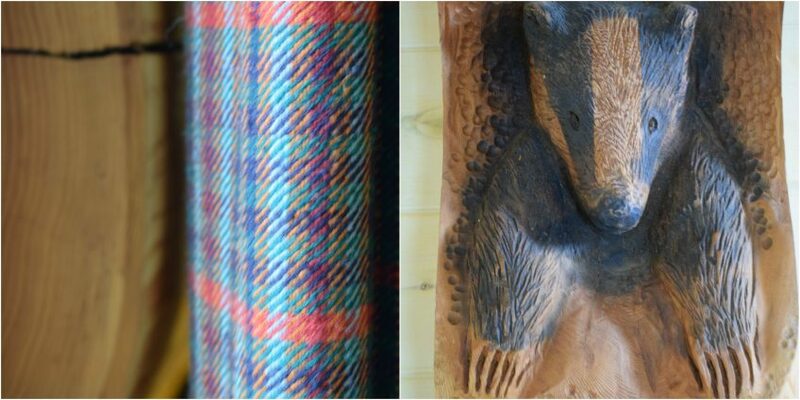 As we stepped inside I was immediately hit by the scent of the Cedar and the size of these huge logs, my eyes moving from one handcrafted thing to another: intricate carved panels with Celtic knots, Highland wildlife and the Lewis Chessmen, an impressive antler chandelier, a hand carved salmon in one of the logs, hard wood furniture… Even the textiles are handwoven. It is, quite simply, one of the most beautiful buildings I have stayed – inside and out. I loved its setting on the edge of the ridge, with the stunning ‘Buzzard-eye view’ of Strathglass (how lovely it must be to enjoy the decking area in warmer weather). 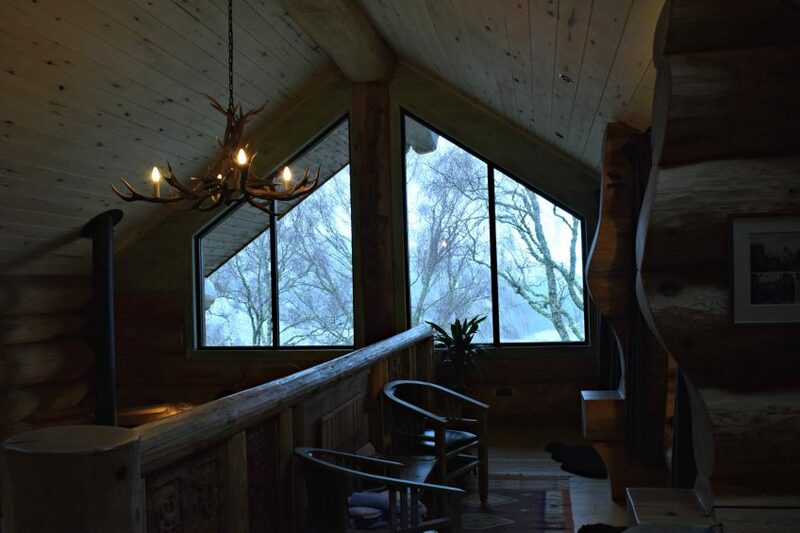 Seeing the trees through the glass panelling on the upper level emphasised the feeling of being immersed in nature. We didn’t have to worry about making dinner and unpacking at the same time as we had ordered one of the home-cooked prepared meals for the first night through the Eagle Brae concierge service (sausage and butterbean casserole – delicious!). As well as prepared meals you can also order groceries, fine wines and rare-breed meats (Eagle Brae’s own wild venison, Hebridean four-horned lamb and rare breed Berkshire pork). They also kindly called us on the Thursday afternoon to let us know that the fish van (Bell’s Seafood) had arrived and my husband promptly bought scallops, wild sea trout, crab and hot smoked salmon for a fishy feast that evening. In our cabin there were two double bedrooms (one downstairs and one on the upper level), two single beds on the mezzanine balcony and two bathrooms (our ensuite upstairs had both bath and shower). My 4 year old adored his bed on the balcony, set into the wall with curtains to pull in front of it. “It’s like a den!”, he exclaimed when he saw it. 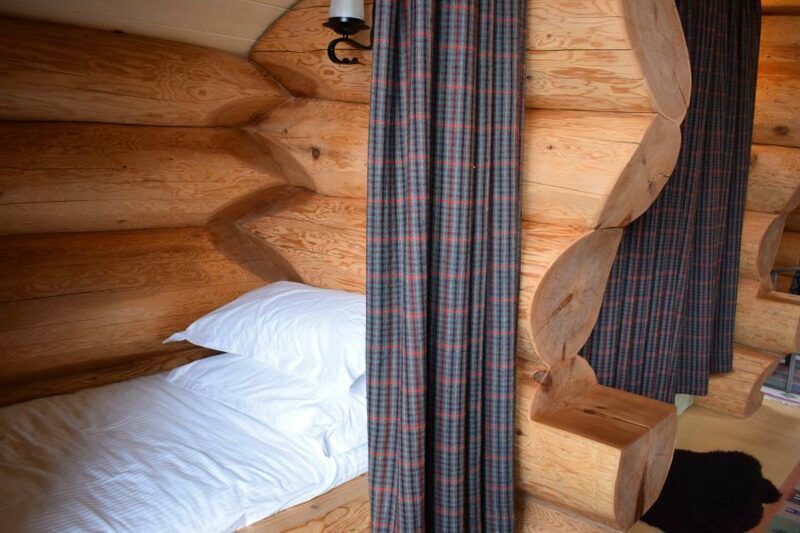 Our room was perfect, the bed extremely comfortable and I just loved the simple touches like a selection of books between bits of wood (also the amazing hand-carved badger within one of the logs). 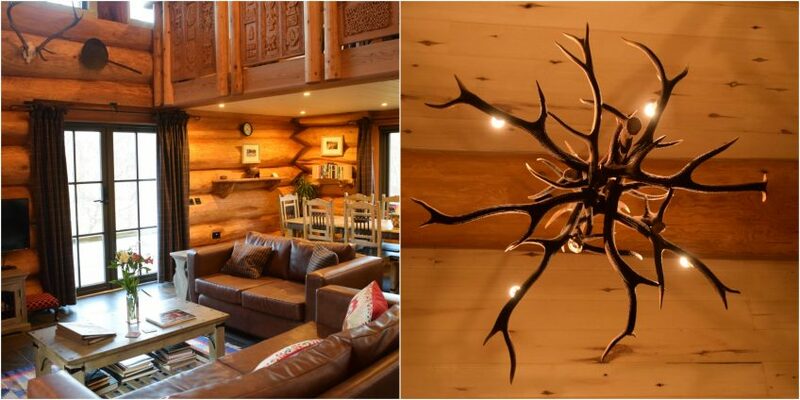 The high vaulted ceiling made the cabin feel airy and light, but it was also really cosy. I particularly loved the underfloor heating and wood-burning stove. What simple pleasure there is in curling up in front of a wood-burning stove, particularly when looking out on snowy scenery (yes, we were lucky enough to have snow during our stay, which made it even more magical). As well as being one of the most beautiful places I’ve stayed it is also the most eco-friendly. 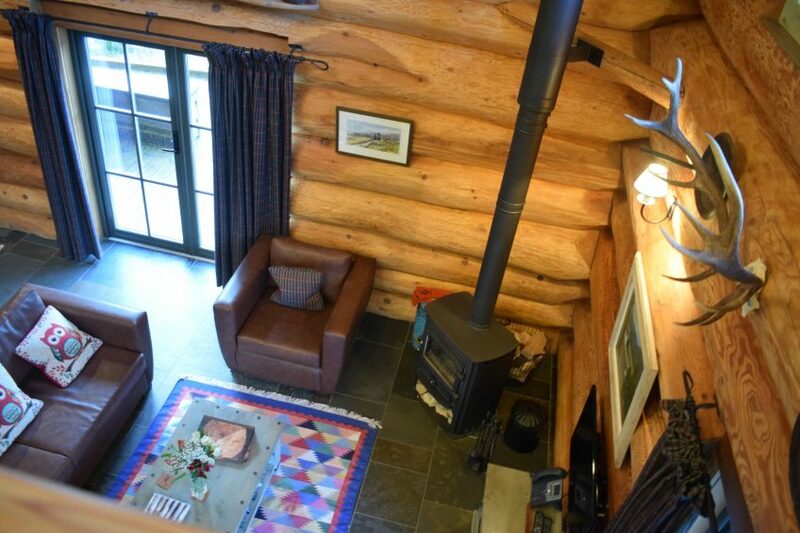 Eagle Brae was designed to be run wholly by renewables with their own micro hydro turbine, underground natural water supply and a biomass boiler for each cabin that powers the underfloor heating system. 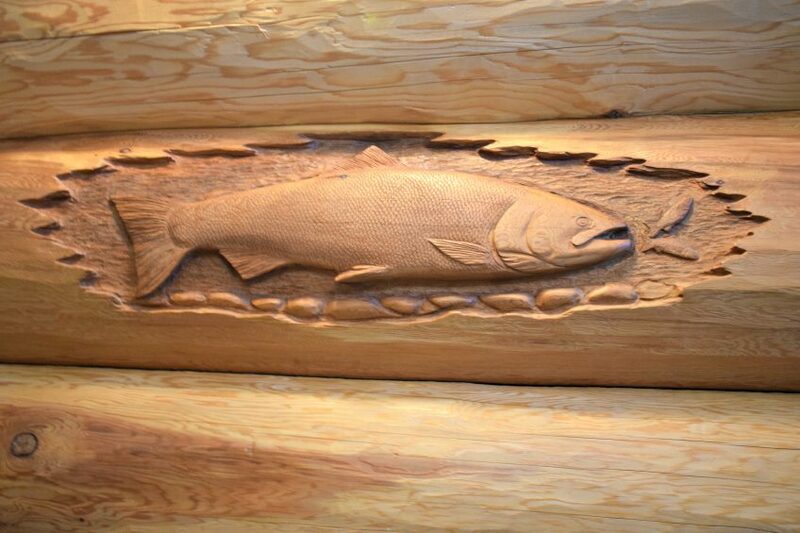 (I was particularly interested to learn that the Cedar logs store heat during the day and release it at night). 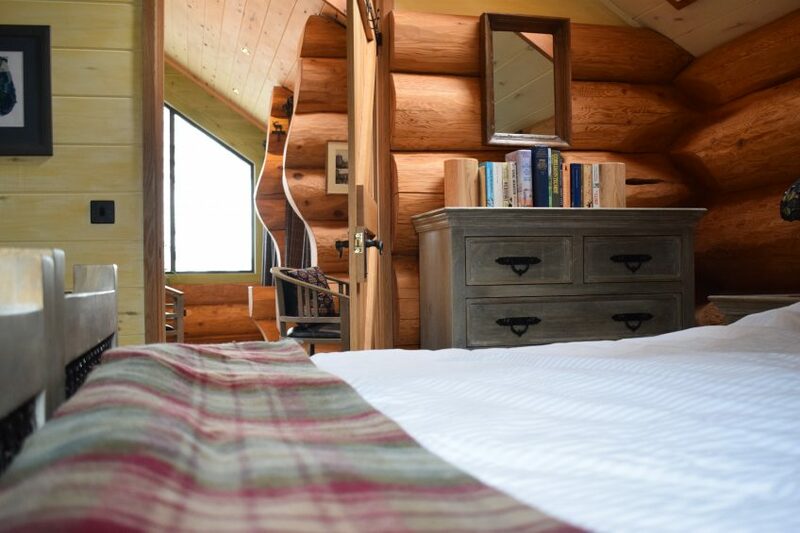 Everything has been thought of and finished to an exceptionally high standard, from the cabin itself and its furnishings to the wonderful little touches. The welcome basket (beautifully made of willow) had lots of lovely goodies, from oatcakes, tablet and drams of whisky to sandalwood incense. 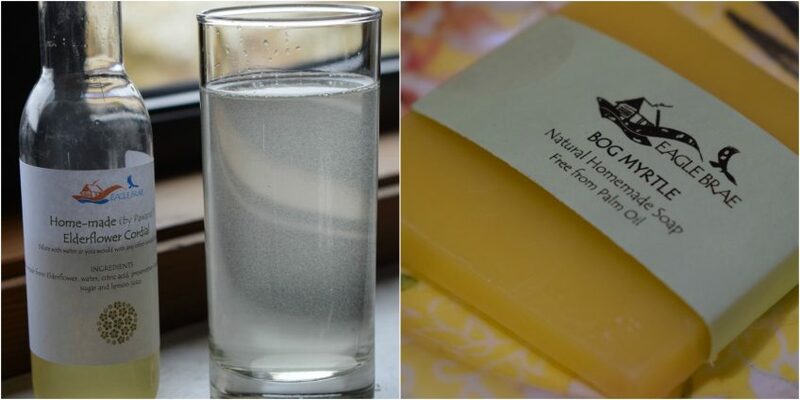 I also loved the Eagle Brae homemade Elderflower cordial and handmade soaps. 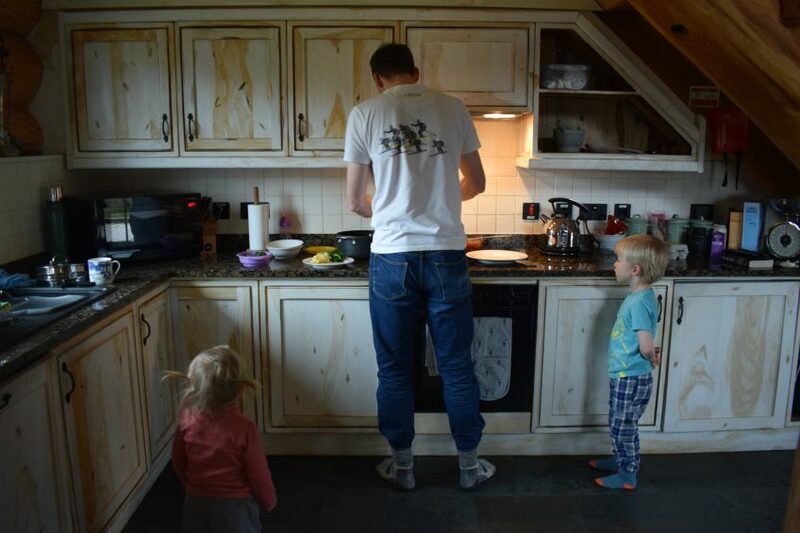 The owners had left children’s plates and cutlery, a nappy changing mat, potty and toilet training seat for our wee ones, in addition to a travel cot and high chair. This made life so much easier and saved us space in the car! There were also toys and children’s DVDs at the reception. Isaac found joy in the simple things, like the hoof prints on the stairs and the carved badger. I asked him what he liked most about the log cabin and he replied: “That it’s made of wood, the fire, my bed, the antler light and seeing the deer”. The short circuit around the resort is perfect for little legs, and lovely that there is a goat paddock and duck pond. 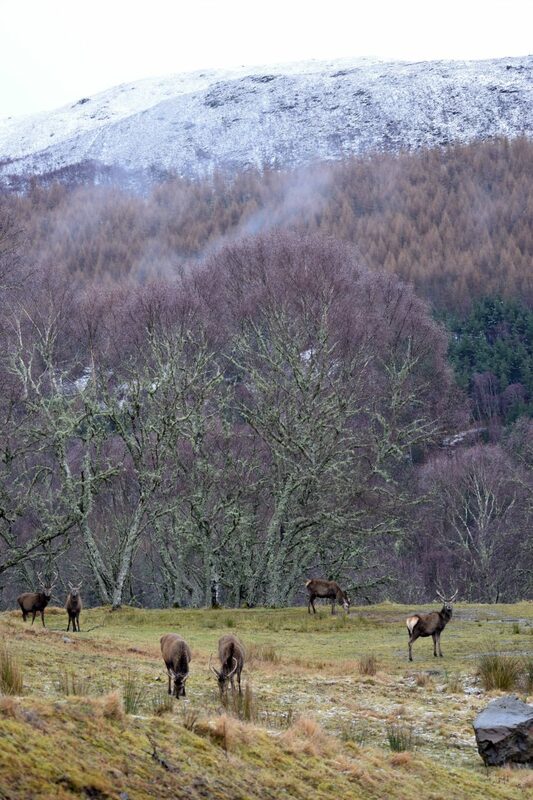 Red deer roam around the grounds and we were lucky enough to spot a stag from the cabin within an hour of arriving – how wonderful for children (and us!) to be able to see these magnificent creatures at such close range. 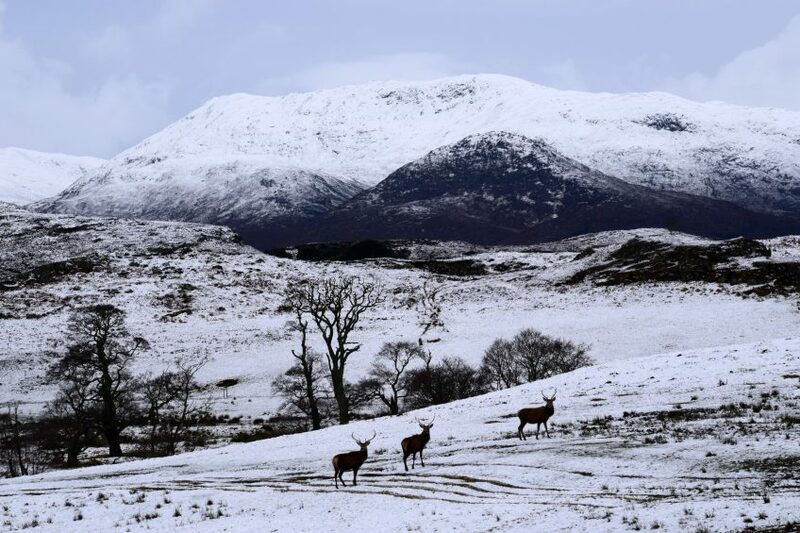 I went out to take some photographs of the cabins in their snowy cloak and the pretty lines of billowing chimney smoke, when I spotted three stags near the reception and followed them down the road. As I stood taking photos of them another sauntered past, and I stood until my fingers were numb, watching them against the layers of purples and greens. I even got to see some rutting. 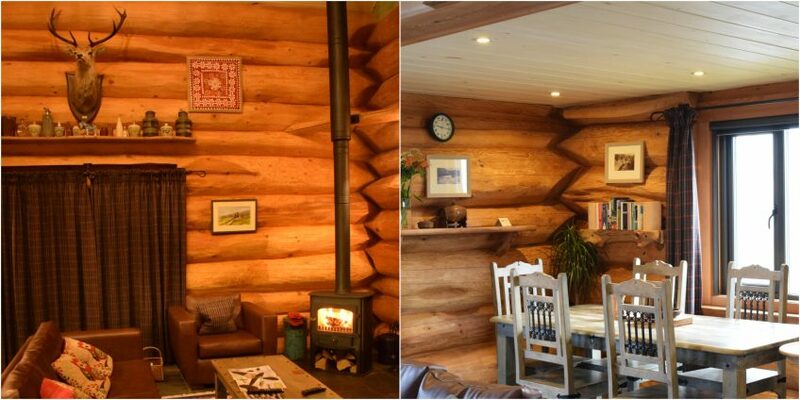 We spent most of our time just enjoying the log cabin, the cosy wood-burning stove and family time together without rushing around. I so enjoy the relaxed pace of a Highland holiday. You can also book onto a range of activities through Eagle Brae including sled-dog rides, pony trekking, bird watching, camera stalking and kayaking (I wish I had booked myself onto the Black Grouse Safari, it sounds amazing). When we managed to tear ourselves away from our lovely log cabin we headed south to Glen Affric for a waterfall walk. Glen Affic is a National Nature Reserve, managed by the Forestry Commission, with one of the largest areas of ancient Caledonian pinewood in the country, and is often referred to as one of Scotland’s most beautiful glens. The spellbinding scenery seemed to be even more atmospheric with the snow. 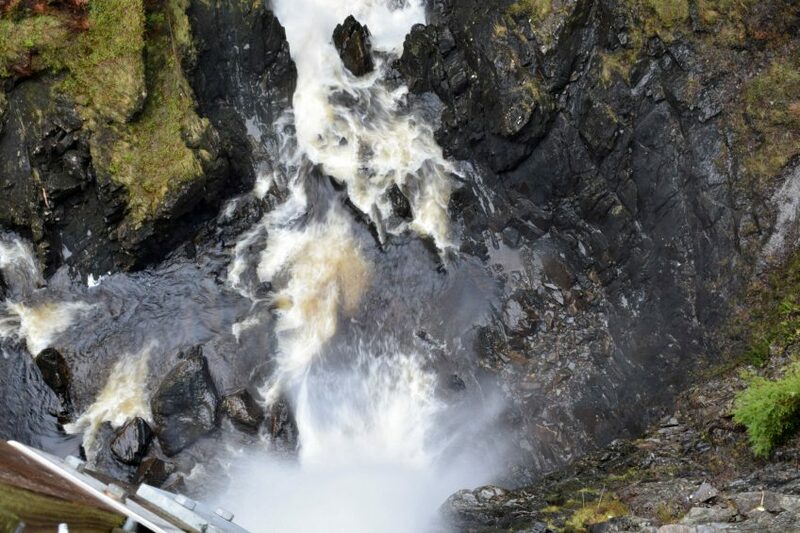 We walked the shorter loop at Plodda Falls, an ideal distance for our 4 year old, and enjoyed viewing the 150ft drop from the upper platform (ok, it made my stomach drop into my knees) and the lower viewing platform. We would also have walked at Dog Falls if we’d had more time, as I had heard it is also rather lovely. 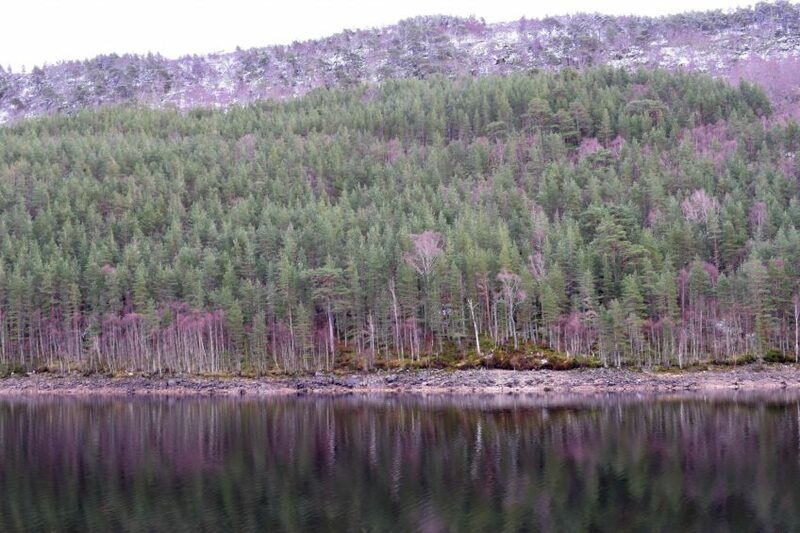 Driving in Glen Affric felt a million miles from the busyness of everyday life, the pinewoods and lochs so peaceful and picturesque – a tonic for the soul. We stopped at Beauly on our way to Eagle Brae, and had lunch at Corner on the Square (which is also a deli shop – I had one of the quiche specials that day, which was delicious, but I had serious food envy when my husband’s Ploughman’s Platter appeared). We went for a browse in the Old School shop, which had a number of rooms with everything from clothes and homeware to wonderful kids toys, books and clothes. 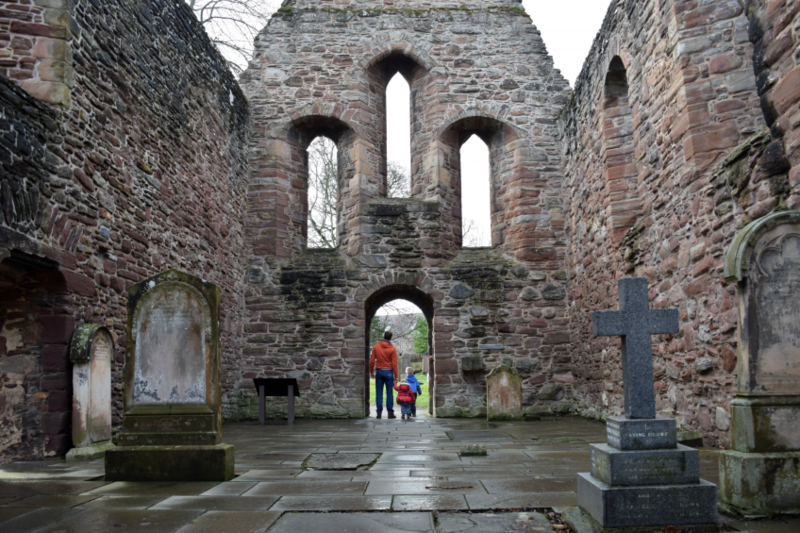 We also walked round the very peaceful Beauly Priory in between rain showers, founded around 1230 and now in the care of Historic Scotland. 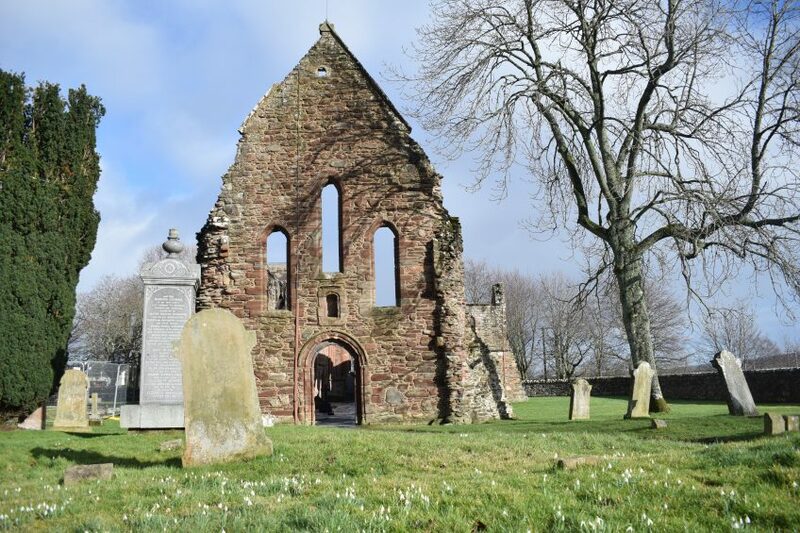 (Keep an eye out for another post on historical attractions you can visit during a stay at Eagle Brae). 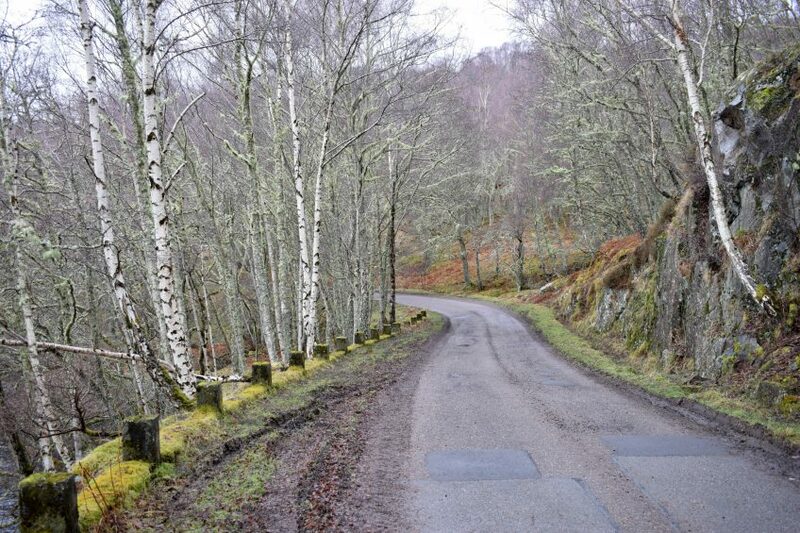 The highlight of this area for me was Glen Strathfarrar, a private glen with restricted vehicle access (from April to September only 25 cars are allowed in a day, and in the winter months you need a key). 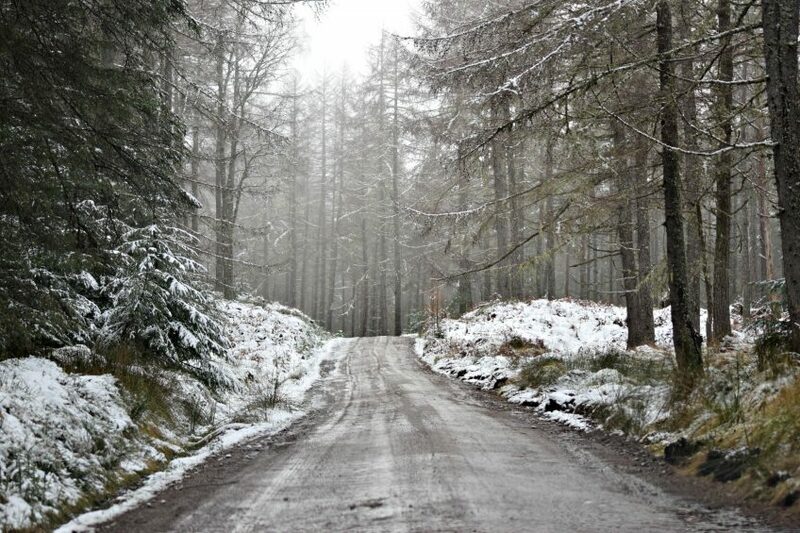 If you stay at Eagle Brae in the winter months they can arrange access if you let one of the team know at least a day in advance (only one Eagle Brae guest vehicle is allowed per day so it also depends on other guest bookings). 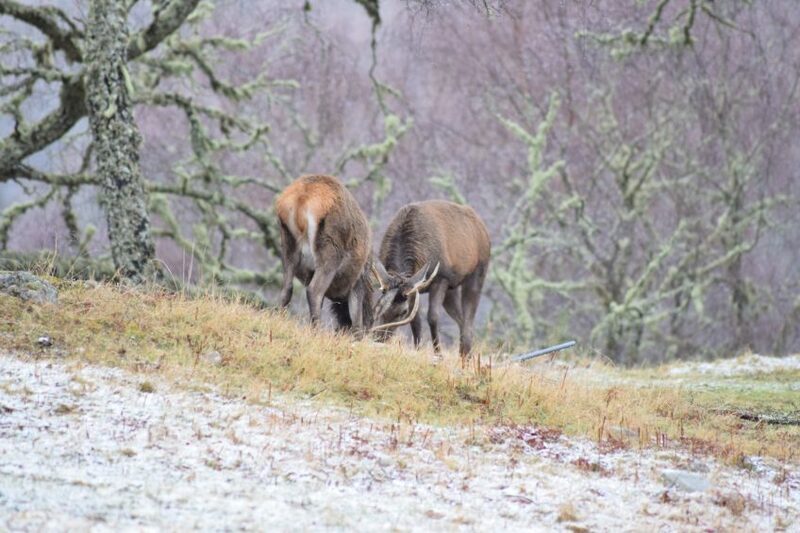 We were thrilled to be able to explore this lovely hidden gem and it is a truly special place, with hundreds of red deer and jaw-dropping scenery. The unspoilt glen has a real wildness to it, with untouched Caledonian pinewoods giving you an idea of what the Highland landscape would have looked like a hundred years ago. It is a truly special place with which I fell completely in love – its raw beauty difficult to capture on photograph or in words. The 17 mile drive should have taken around an hour and a half there and back, but with my many photo stops we spent almost two hours one way and 40 minutes on the way back. 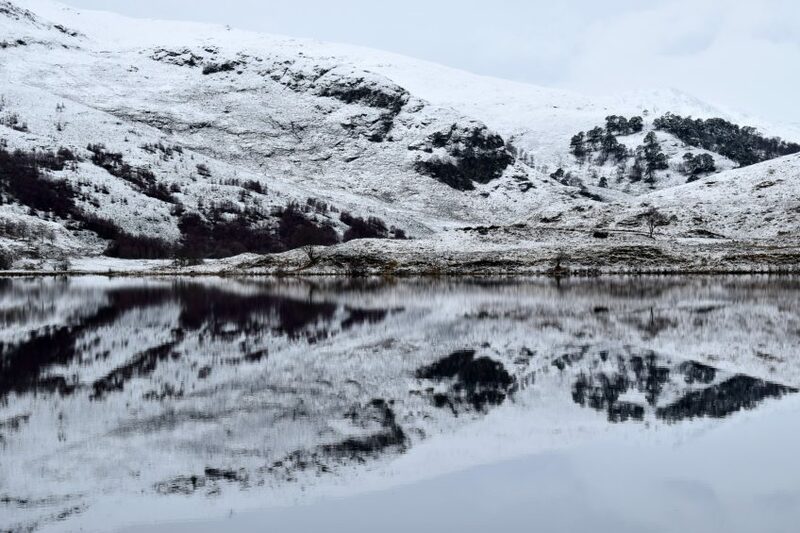 The snowcapped hills reflected beautifully in a mirror loch, the only sounds of birdsong and the bleating of wild goats. 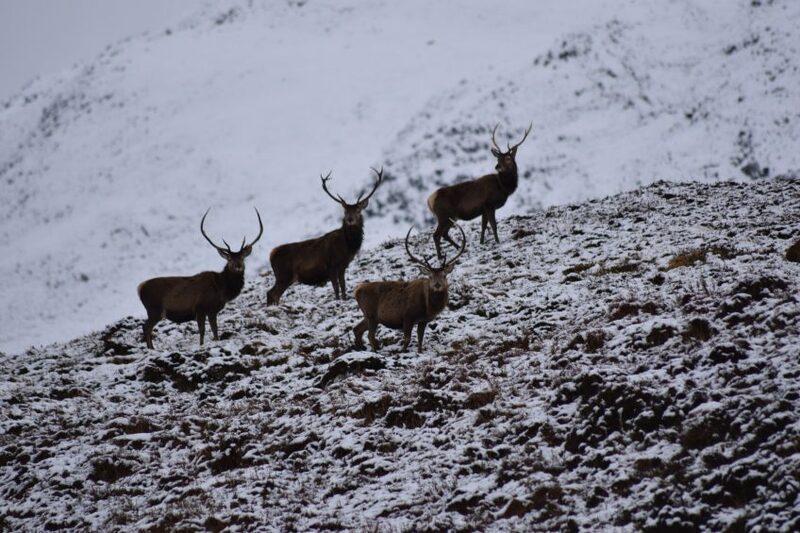 I have never seen so many stags at such close range, some posing magnificently against snowy backdrops. 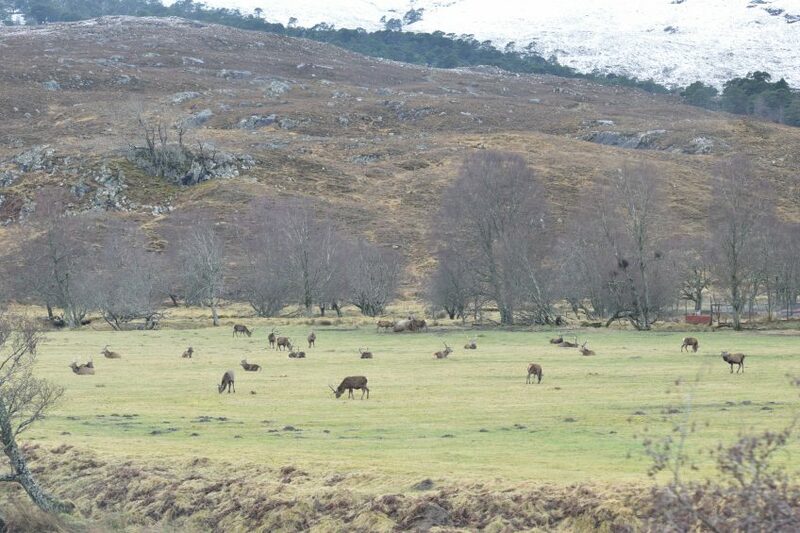 Isaac was chief stag-spotter to begin with but the further into the glen we drove, the more stags we saw – herds grazing at the far end of the drive, and some large groups just metres from the car. This drive was the icing on an already perfect cake – our short break in this incredibly scenic area quickly nestled into the folds of my heart. 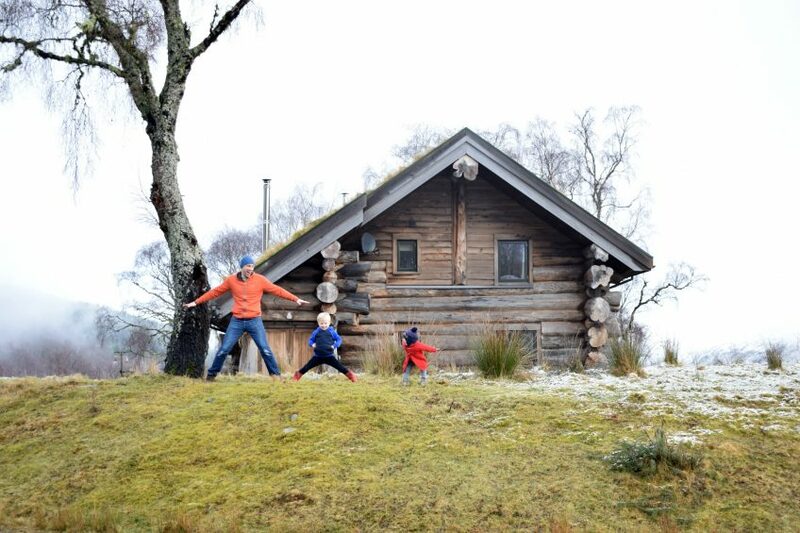 Eagle Brae is a real ‘get-away-from-it-all’ place and an ideal choice if you’re looking for an eco family holiday. Playing outdoors, listening to birdsong, watching red deer, cosying in front of the fire, walking in peaceful surroundings – what better way to spend a family holiday? 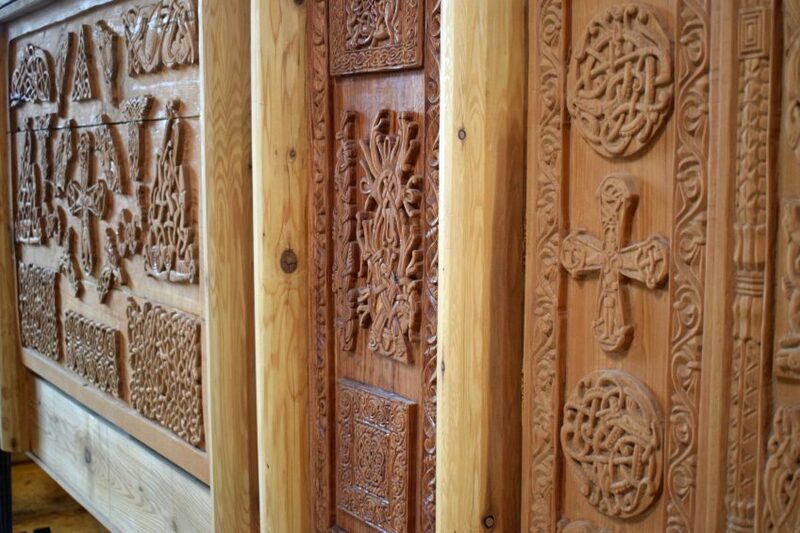 There is something so lovely about being surrounded by the scent and sight of wood, particularly when it is so beautifully handcrafted; I felt like I had plugged myself into nature for two days, leaving with my batteries recharged. My stay at Eagle Brae was complimentary but the opinions expressed here are entirely my own. Great blog post Emma – so enjoyed reading it. I want to go there!